Community Description: This complex of post fire associations of aspen, birch, and other species can occur as open canopy woodlands, as closed forest, or, in very exposed areas, as stunted, dense shrublands. Paper birch, big-toothed aspen, quaking aspen, and red maple are the most common trees; other trees may be common at some sites. The shrub layer, usually < 50% cover except in the shrubland variant, is variable; shadbush (at low cover) and gray birch (locally abundant) are the most consistent species. Herb cover is higher under more open canopies, where more light reaches the ground. Many sites have patches of lowbush blueberry or black huckleberry; bracken fern is the most characteristic herbaceous species. The bryoid layer is sparse. Back to top. Soil and Site Characteristics: Occurring in various settings, nearly all sites are post-fire and/or or post-harvest and typically occur on nutrient-poor soils. The mineral soils are usually < 25 cm deep, and some stands occur on thin glacial till or bare granite. Documented examples all have well drained to excessively drained soils with pH 5.0-5.4. In time, most sites will transition to one of several matrix-forming forest types such as northern hardwood forest or spruce - northern hardwood forest. The shrubland form occurs on exposed low elevation summits (900-1200') and is currently documented from Acadia National Park and a few other sites Downeast. Back to top. Diagnostics: The canopy is dominated by early successional deciduous trees (poplars, birches, red maple). Conifers and red oak may be present but are not dominant. Lowbush blueberry and bracken fern are usually present below. Sites are on thin mineral soil over till or bedrock. Back to top. Similar Types: Other deciduous forest/woodland types have greater amounts of red oak (Birch - Oak Rocky Woodland) or have northern hardwood species dominant (Northern Hardwoods Forest). Some Oak - Pine Woodlands can be strongly deciduous and can resemble this type, but red oak cover exceeds that of birches, aspen, and red maple combined. Back to top. 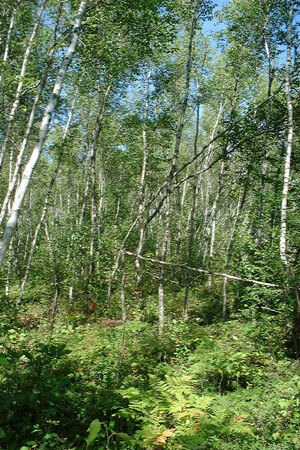 Conservation, Wildlife and Management Considerations: Aspen - birch stands originating after heavy harvesting are frequent in Maine. Exemplary sites, however, are those that originated after fire or other natural disturbance, since those sites best reflect the composition and condition of natural processes. 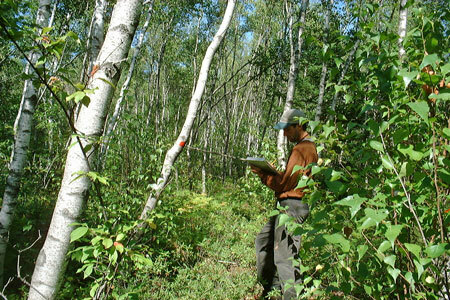 Natural succession dictates that the aspen - birch dominance will not be long lived, and in time, most sites will transition to one of several matrix-forming forest types such as northern hardwood forest or spruce - northern hardwood forest. Conservation efforts should not attempt to maintain the aspen - birch dominance, but rather to let natural succession proceed. Good examples are known from public lands and private conservation lands. Ruffed grouse commonly use young stands with dense sapling cover and little herbaceous cover. Snags remaining after wildfire in northern or eastern occurrences of this community type provide foraging strata for three-toed woodpeckers and perches for the rare olive-sided flycatcher. Back to top. Distribution: Statewide, less common in southern Maine. Extends eastward, westward, and northward from Maine. Landscape Pattern: Large Patch, or temporary matrix in successional areas. Back to top. Characteristic Plants: These plants are frequently found in this community type. Those with an asterisk are often diagnostic of this community. There are no documented rare plants associated with this natural community. Acadia National Park Hancock Co.
Black Mountain, Donnell Pond Public Lands Hancock Co.
Deadwater Brook, Appalachian Trail Piscataquis Co.